Students are trained in the use of technical and flat-rate information systems, as well as a variety of hand and power tools. Training also includes the use of electronic diagnostic and other test equipment. 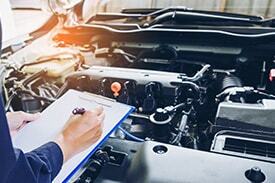 Specialty training is provided in such areas as air conditioning, front-end alignment, and the use of computerized automotive repair data systems. Instruction coincides with the eight (8) areas recognized by the Institute of Automotive Service Excellence (ASE) for professional technician certification, and provides for eight areas of specialization in Engine Repair, Automatic Transmission/Transaxle, Manual Drive Train and Axles, Suspension and Steering, Brakes, Electrical Systems, Heating and Air Conditioning, and Engine Performance. Students are encouraged to participate in the ASE Certification testing program during their training. The Automotive Service Technology program is certified as a Master Training Program by the National Automotive Technicians Education Foundation (NATEF) meeting national training standards in eight Automotive Service Excellence areas of certification. Upon completion of the program and meeting eligibility requirements, including the attainment of an aligned industry credential, students may be awarded credits toward an AS or AAS Degree by Broward College or the Florida College System. Students must enroll in Broward College within 2 years of completing the program at Atlantic Technical College. Additional college credit may be awarded with the attainment of additional industry credentials. Certification fees and tools for entry level employment are additional. To get started in the Automotive Service Technology Program, sign up today for a program orientation or contact the counselor at Brooke.Lehmejian@browardschools.com today! Demand for Automotive Technicians is expected to grow about 5%* between 2014 and 2024. Entry level wages are about $12.50/hour**. Actual wages vary according to education, experience and certifications.